Beautiful architect-designed 5 bedroom, 4 bathroom villa set in lovely gardens with a good sized private pool (9x4m). 5 bedrooms spread over two floors. 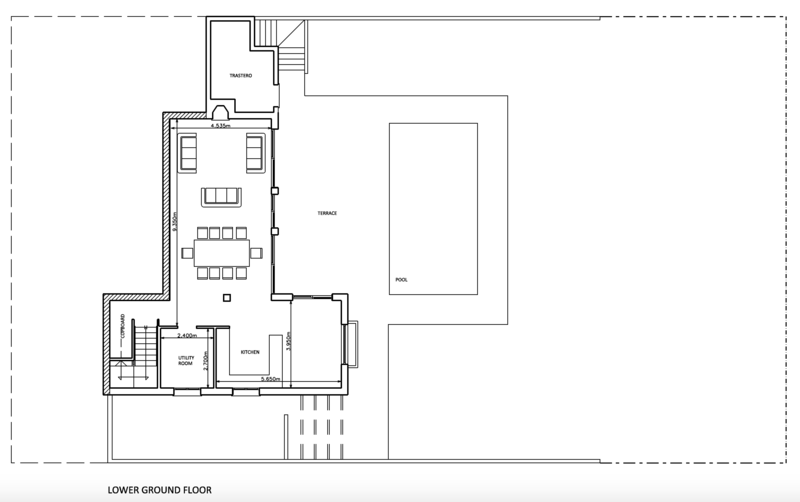 First Floor: Master bedroom with king size bed and en suite with bidet, bath, walk-in shower and Jack and Jill basins. Roof terrace where your view is almost at the tops of the spectacular pine trees; a perfect spot to watch the woodpeckers with coffee in the mornings and listen to owls with a glass of wine as evening falls. 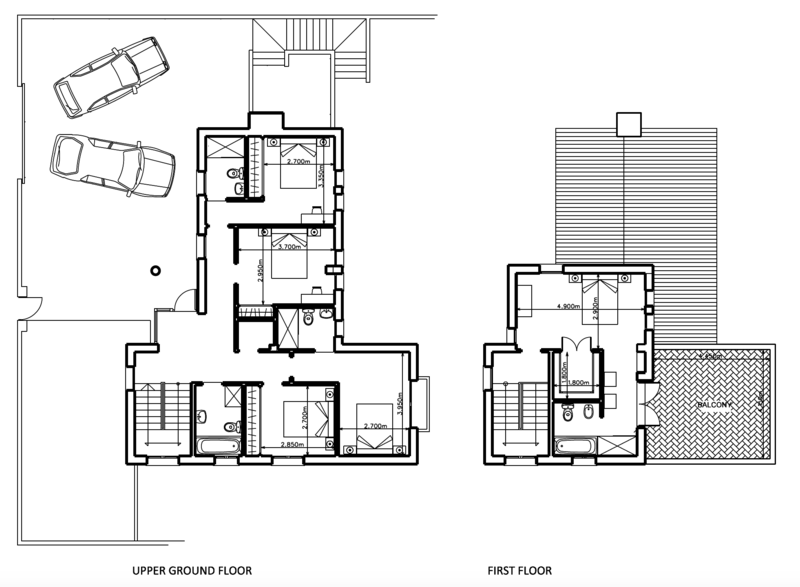 Upper Ground Floor: Four bedrooms – one king, one double each with en-suite walk-in shower rooms, two twin bedrooms with a shared family bathroom with bath and shower. Entrance door is on this level. Open plan kitchen/dining/living space is a light, neutral space with great garden and pool views through a wall of floor to ceiling doors and windows. The well-appointed fitted kitchen is fully equipped with cooker and hob as well as kettle, toaster, microwave, coffee percolator and nespresso machine. We aim to provide everything you need for an easy home from home experience. Adjacent utility area has fridge freezer, dishwasher, washer and dryer. Comfortable seating with two large sofas and matching arm chair. The 42inch TV has Spanish, German, French and English channels. A Nintendo wii and selection of games is available for entertainment and good wifi signal throughout the house and garden. Fun table football set provided. Dining table seats 8-10 and additional table in kitchen area seats 6 comfortably. Floors are tiled throughout on all levels. Outside there is private parking for two cars behind a remote-controlled gated entrance. Pretty and secluded, the lawned rear garden is well established – framed at the far end by the tall pines typical of this area. 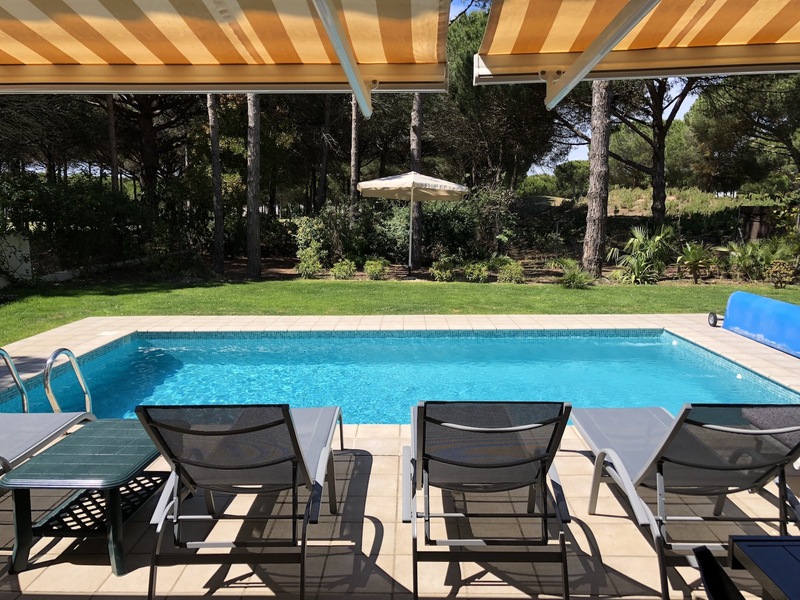 Private pool (heated) is tiled around with plenty of space for sun-loungers. The villa looks out beyond the garden to further greenery and the tranquility of the Novo Sancti Petri Hills golf course. BBQ and large outdoor dining set situated on the terrace. To the side is a tiled courtyard with badminton net and basketball hoop for the more energetic guests.